SUBHEAD: Along with providing food, farms can heal forests — or even make them. Image above: Ariel photo of food forest developed on property in Hawi, in north Kohala on the Big Island of Hawaii. 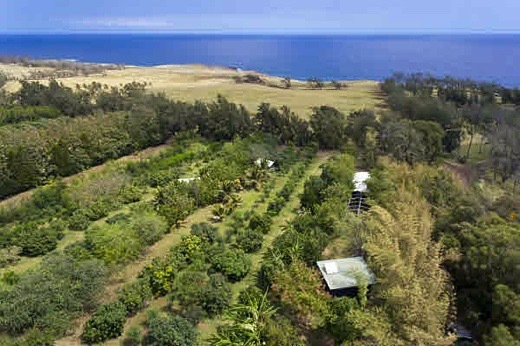 From (http://www.hawaiilife.com/articles/2014/02/farm-properties-hawi-north-kohala/). Let’s admit it, guys: Trees are pretty awesome. They’re nature’s air conditioners, they’re hella pretty to look at, and they’re really efficient carbon sinks. And, it turns out, when they come together to form a forest, trees gain the superpower of living pretty much forever. (The Amazon forest — what’s left of it, that is — has been breathing for about 55 million years, and it’s not even the most ancient on the planet.) The forest ecosystem — bugs, soil, logs dead or alive, roots, shrubs, creepers, vines, trees, and all — is one hell of a long-term polyamorous relationship. So here’s an idea: What if everything in that long-living ecosystem were edible? What if the entire forest were an agricultural system? That’s a real thing, and it’s called forest farming, or agroforestry. The idea behind it is simple: Cultivating useful food or medicinal crops in forests while maintaining the trees’ health. Not to get all hipster-technical on you, but this is an example of “integrated permaculture,” wherein humans adapt farming practices to mimic or reside within a natural ecosystem. The goal is a productive, sustainable agricultural system that’s as diverse, resilient, and stable as our natural ones. Happily, this idea has been around for millennia, in the form of Kerala’s home gardens, Mexico’s family orchards, and even ancient Mayan gardens. Forest farms are “probably the world’s oldest and most resilient agrosystem,” writes Douglas John McConnell, author of The Forest Farms of Kandy. Less happily, agricultural industrialization in the 20th century introduced monocultures: Vast stretches of ruler-edged rows of wheat stalks, or corn, or tea shrubs — gobbling up tons of synthetic chemicals — became the status quo. Forests were space-intensive nuisances to be razed. The age-old belief that we’d benefit more from working with an ecosystem, rather than being masters of it, faded. But forest farming is on the way back. In the 1980s, farmer and naturalist Robert Hart, inspired by Keralan and Japanese garden systems, adapted the principles of tropical forest gardens and applied them to temperate climes. In his smallholding in Shropshire, England, the man nurtured a mind-boggling array of edibles: apple and pears, grapes and kiwi fruits, blackcurrants and gooseberries, and herbs and salad vegetables. In general, the theory goes, a forest comprises seven integral layers, each of which can be used for crop production. If we pick the right elements for each layer, and let forests do what they’re best at (you know, living long and prospering), a food-filled Garden of Eden might be within grasp. For example, the canopy — the forest’s top layer — could consist of fruit and nut trees. The “shrub layer” would include fruit bushes such as raspberries and blueberries. Perennial vegetables like kale belong to the “herbaceous layer” gang. Edible roots and tubers like potatoes and yams form the magnificently named “rhizosphere,” or “underground layer.” Integrating animals into the system with rotational pasturing sequesters carbon in the soil, helping reverse climate change, as well as creating a more sustainable — and natural — forest ecosystem. There are two general tenets of forest farming: cultivating a garden that mimics a forest, a la Hart’s smallholding and Seattle’s Beacon Hill Food Forest, or growing crops in a natural forest. Wellspring Forest Farm is an example of the latter. In upstate New York’s forests, farmer and trained ecologist Steve Gabriel cultivates a selection of food crops that pretty much resemble a holiday dinner at Gran’s: shiitake, oyster, red wine cap and lion’s mane mushrooms; duck eggs and pastured lamb; maple and elderberry syrups. The native trees earn their keep by attracting natural predators as pest control, providing shade for the dark-dwelling fungi, and feeding animals with a constant supply of bugs and grass cover. In return, the crops compensate trees by building soil, preserving water quality and run-off, and adding biodiversity to the indigenous demographic. The farm restores and protects the forest ecosystem, and vice-versa. Talk about long-term #relationshipgoals. Indeed, the best long-term relationships require lots of TLC, which is probably why not everyone has jumped onto the forest garden bandwagon just yet. All this talk about the future leads us to — ta-da! — climate change. “Climate change has a much more detrimental impact on monoculture,” says Selena Ahmed, a sustainable food researcher who has spent six years studying sustainable tea plantations in China. She advocates for a “climate smart” agriculture system that can take the heat of a changing climate: droughts, floods, extreme heat or cold, increased forest fires. According to Ahmed, such a system essentially combines elements like diversified cropping, chemical-free soil and pest management, and efficient use of water. Sounds a lot like the tenets of forest farming. In a tea plantation in West Bengal, for example, two acres of virgin forest are retained for every acre of tea — ensuring a rich, stable environment for battered tea shrubs. And the success of that plantation is kind of a green, polite “up yours” to monocultures everywhere. In a world where the weather’s turning increasingly wacky, having farms and forests that can take — and mitigate — the heat sounds like a bandwagon we can hop on. If you are passionate about sustainability, and are looking for a once-in-a-lifetime experience, apply now to spend a semester studying with ISDSI in Thailand. Working directly with local communities, students work with small-scale organic farmers, backpack into remote tribal villages to learn about forest ecology, and sea kayak and skin dive the islands of Southern Thailand to study coral reefs and mangroves.